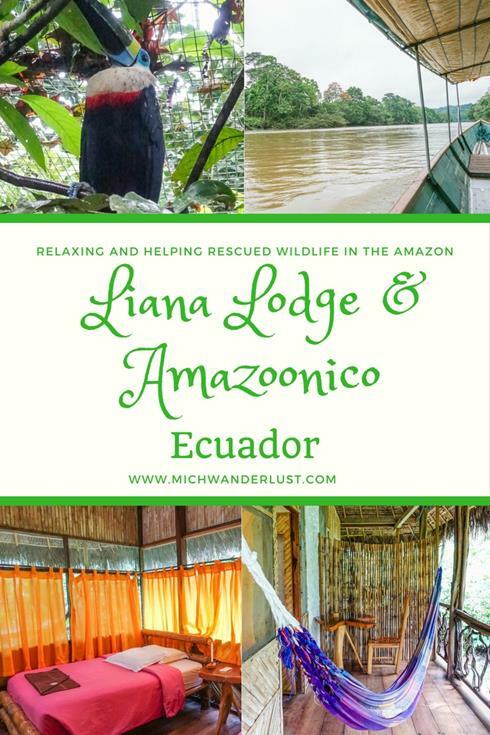 There are plenty of good reasons to visit Liana Lodge in the Ecuadorean Amazon. 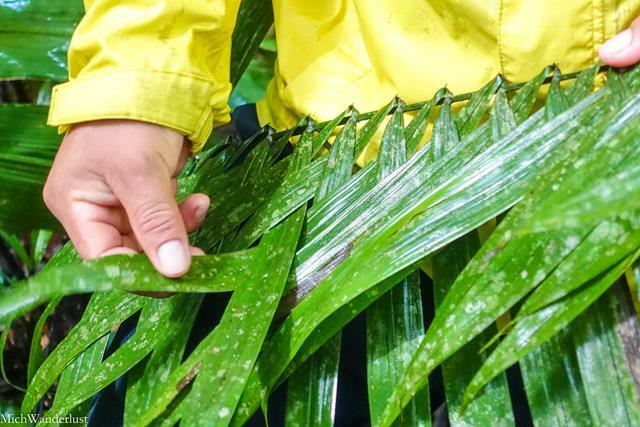 For one, it’s a great example of responsible and sustainable tourism, as it’s run by a Swiss foundation whose objectives include preserving and protecting the rainforest, and implementing sustainable rainforest management in the local Ahuano community. I had an additional, very personal, reason to check it out. When I was planning my South America trip, I knew that volunteer work would be part of it. Eventually, it came down to two very different options, both coincidentally in Ecuador. I went to Intag to teach English, but I couldn’t leave Ecuador without checking out what might have been: an animal rescue centre called Amazoonico. And how does Liana Lodge come in, you say? 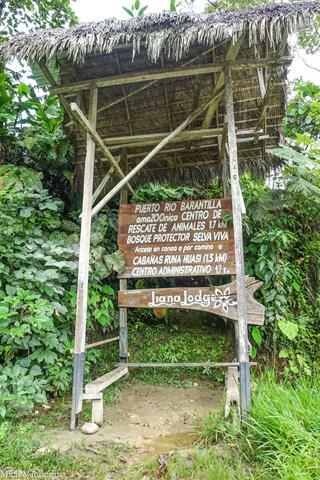 Both the lodge and Amazoonico are run by the same foundation! 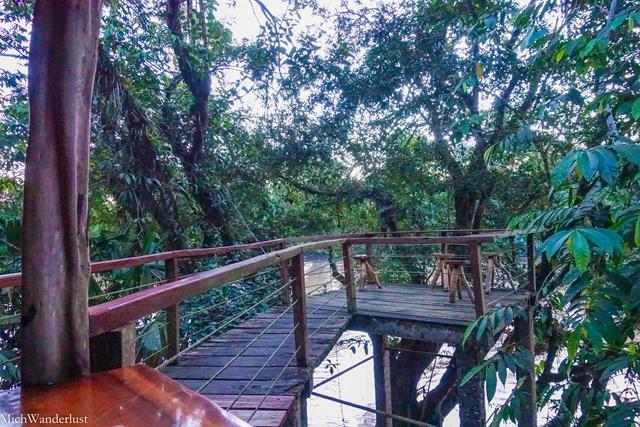 If you don’t have much time to spend in the Amazon, Liana Lodge would be a great way to get a taste of it. 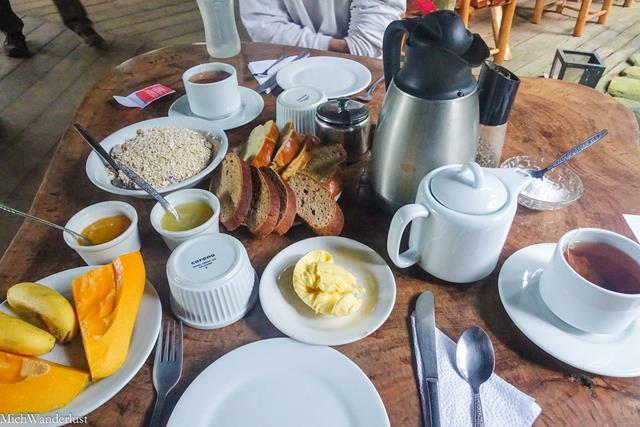 We spent 2 nights at Liana Lodge, which means 1 full day of activities. It cost USS$194 per person – all activities and meals included. You can of course opt for a longer stay! 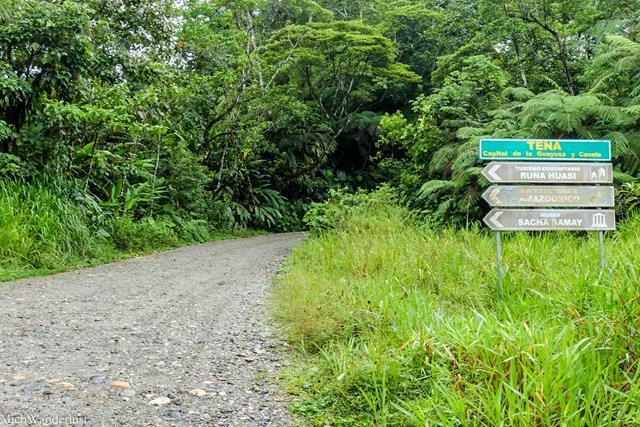 It’s not the cheapest option out there (I did a 4D3N tour with Nicky Lodge in Cuyabeno for $280). But it was worth it for me because I didn’t have that much time, it was for a good cause, and I really wanted to visit Amazoonico! Is this the most beautiful jungle lodge ever, or what? I was immediately blown away by the villas. The bright colours of the room give it a cheery air and immediately make you feel at home. Unlike some other lodges *cough* Nicky Lodge *cough*, here there’s plenty of privacy with only 2 beds to each room. Don’t mess with my hammock, guys. PRIORITIES. 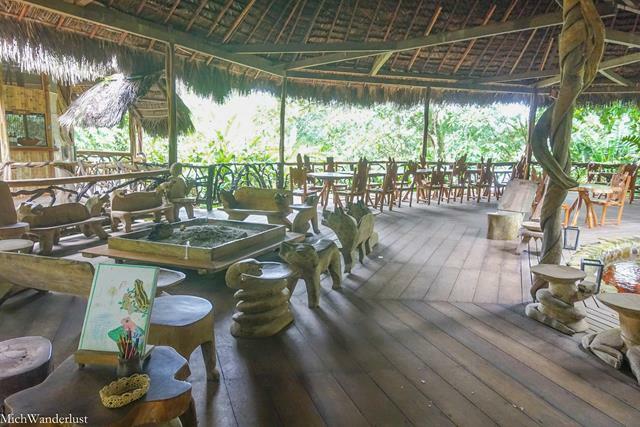 Much of the lodge, including the chairs you see above, are made from local tree species and hand-carved. Well, if you’re in the rainforest, it kinda makes sense, right? 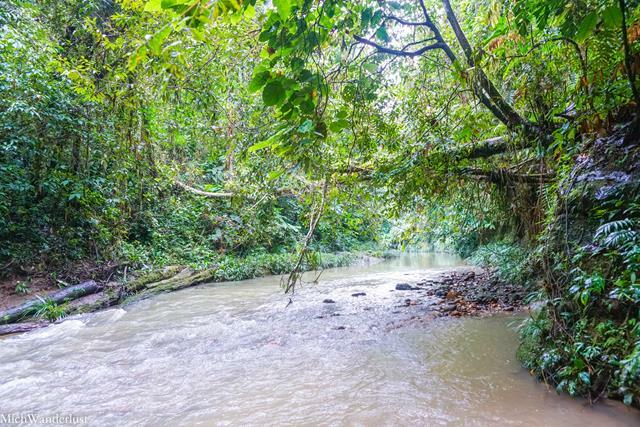 There’s no wi-fi, but that’s normal in the Amazon. Go on a digital detox and immerse yourself in the beautiful surroundings! 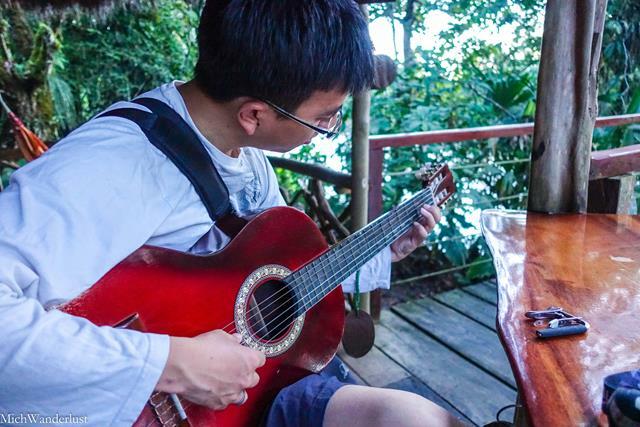 Have a drink at the bar, explore the lodge, play the (somewhat out-of-tune) guitar. And if you get bored, refer to the hammock above. 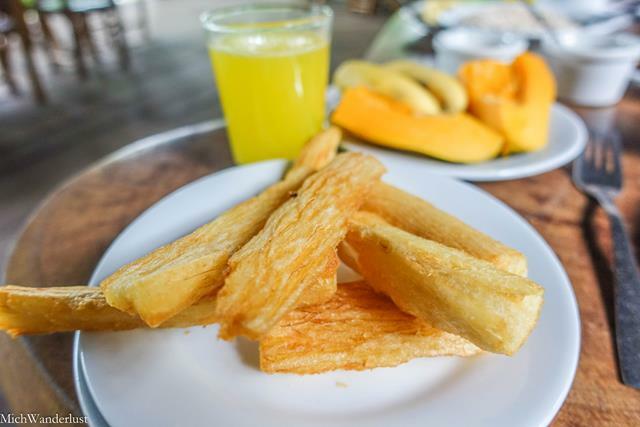 If you’re ever in Ecuador, promise me you’ll try fried yuca (cassava). It may not look like much (above), but it’s delicious. You have a whole menu of activities to choose from, like visiting a local community, fishing and gold panning, and raft-building. But we like hiking, so we picked the longest hike available (approx. 5 hours). A couple of Amazoonico volunteers wanted to join us and we were more than happy to have them along. I got to hear all about life as an Amazoonico volunteer, which I almost was! Our guide, Juan, was from the local Ahuano community and showed us traditional uses for the plants. E.g. 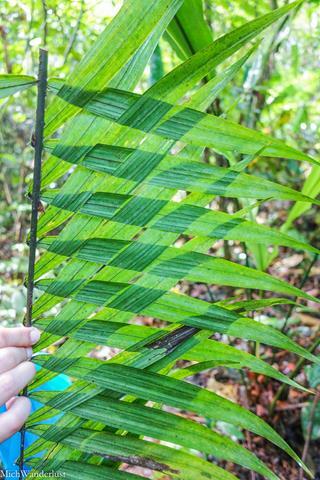 they weave these leaves to create a thatched roof. The water just rolls right off! The tree below was really bizarre. What do you think? It’s not painted – that’s its natural colour! Yep. My main concern was slipping and falling as the ground was pretty wet. It’s the rainforest, after all! It rained a bit during the hike too, so (at the risk of sounding like a broken record) rain gear is a must. We had lunch by the Rio Rodriguez. It’s main selling point is the crystal-clear water, but that day it was anything but. Recent heavy rains had made the water all muddy, but that didn’t deter the others from taking a dip in the river. I was all no thanks, though. We had lunch there – a nice boxed lunch and salad served on a leaf! I really appreciated the effort to go plastic-free. After lunch, we hiked up to a viewing point, where we eventually emerged from the trees to see… more trees. That’s the Amazon for you! After that, we made our way to Amazoonico. You have to pay a small entrance fee of US$2.50 or so per adult, but it comes with a free guided tour by a volunteer. Our guide was a guy from Quito and it was his first tour in English! I thought he did really well. 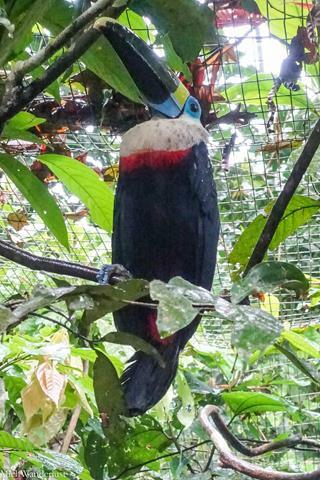 The Ecuadorean Ministry of Environment sends confiscated animals to Amazoonico. They come from e.g. the black market, or homes where they were being kept as illegal pets. 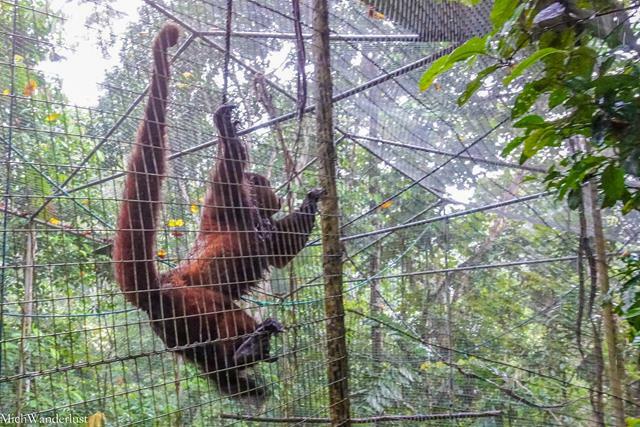 Amazoonico tries to rehabilitate and release these animals into the forest reserve owned by the same foundation, but for many, behavioural and physical problems make this impossible. In those cases, they are essentially stuck at Amazoonico for life, albeit in the best living conditions possible. There are spider, capuchin and woolly monkeys. It was pretty sad when our guide pointed out those who couldn’t be released, either to due to aggressive behaviour or some physical/mental impairment. The monkey above was one of those. Arguably one of the show-stealers here. Aren’t they beautiful? 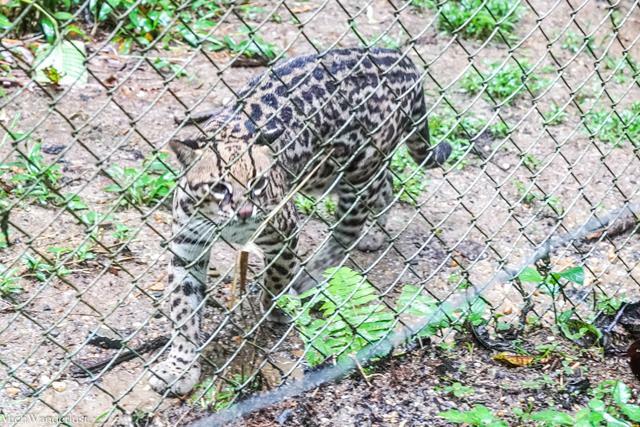 They have a pair of ocelots, and we were very lucky to see them. They came out and walked around although it was raining! SO CUTE. Especially the baby! His stripes will disappear as he gets older. Other animals we saw included pecaris (like pigs but very aggressive) and jaguarundis (small wild cats). I didn’t take many photos, though, because of the rain. Our (original) guide Juan then walked us back to Liana Lodge. It’s only about 10 minutes away, so if you’re staying at Liana Lodge, Amazoonico is a must-see. Do I regret not volunteering there? I chose Intag because one of my main goals was to improve my Spanish and really immerse myself in a local community. Amazoonico – made up as it is mostly of international volunteers – wouldn’t have allowed me to achieve those goals. Plus, in Intag the kids are lucky to have English volunteers once or twice a year, whereas Amazoonico seemed pretty well-staffed. But if you have a passion for animals and don’t care about the Spanish immersion thing, I’d recommend checking out Amazoonico. The volunteers all spoke very highly of it and seemed really upset about their eventual departure. From Tena, take a bus to Puerto Barantilla. Note that the bus terminal isn’t the main bus terminal – it’s 2 blocks down, but not hard to find. There are a number of daily buses to Puerto Barantilla. We took the 1.30pm bus and the journey took about 1h25min. You need to ask the bus conductor to tell you when you reach, as it’s not the end of the line. I basically kept reminding him every time I saw him, and we got off with no problems. On the left side of the road, you’ll see a shelter. 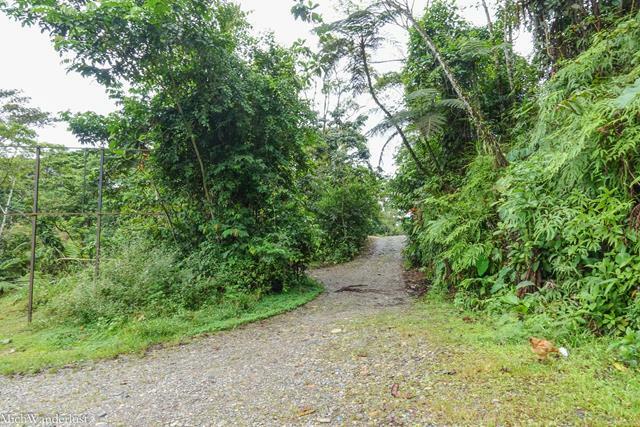 From the main road, turn left into this nondescript path. Go straight and don’t take the left-hand turn going downhill. 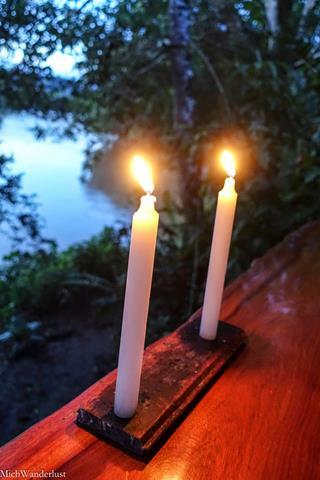 You’ll arrive at the river, where a canoe will be waiting to take you to Liana Lodge. The boat ride takes about 5 mins. 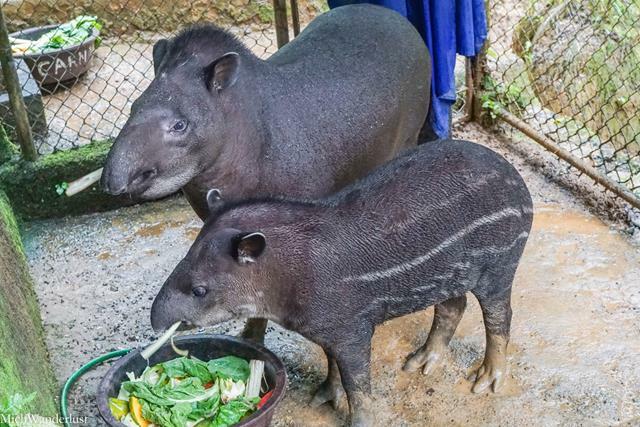 Have you been to the Amazon or volunteered at a similar animal rescue centre? What was it like? The lodge was definitely more beautiful than I was expecting. And visiting the animal rescue centre was a highlight, for sure. It’s kid-friendly too! 😉 Thanks for stopping by, Nancy! Glad to hear they have lots of volunteers because it does sound like they are doing good work. The animals are so cute/pretty. 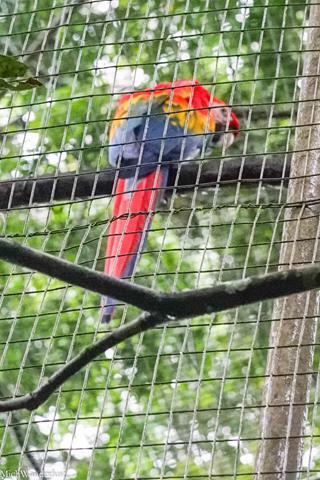 I just love the macaw. The lodge looks really nice too. I would be all over that hammock! Wow this is so beautiful! I love the idea of a lodge really both in tuned with nature and charming, but also eco-conscious and supporting responsible tourism. 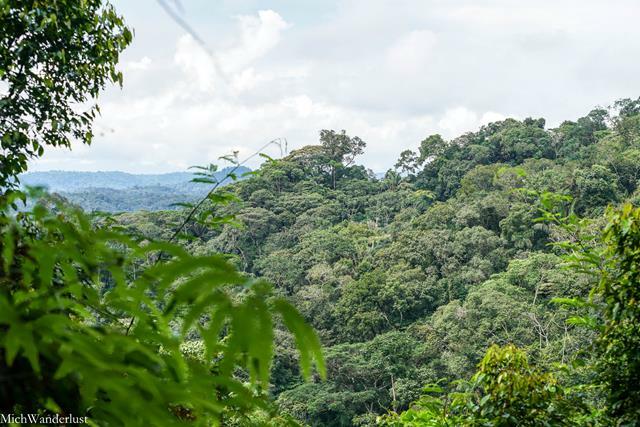 I’ve never been to the Amazon but I would love to go for the change of pace and wildlife. Hmm I wasn’t aware that there were luxury cruises down the Amazon! It makes sense though. Perhaps not in Ecuador, but in one of the other countries. Hope you get to go someday. Thanks for stopping by, Wendy! I would love to visit Ecuador! This lodge sounds great. fab photos of the animals! I hope you get to visit Ecuador someday! It’s a really beautiful country, relatively small but with 4 very different regions (the Andes, the Amazon, the coast and the Galapagos) so you can really see a lot in a short time 🙂 Thanks for stopping by, Annabel! I think tours are a great option when you are short of time. This place looks relaxing and yet interesting and educational. Quite the destination to visit. Yes, you’re quite right. It was a far more relaxed experience than my previous Amazon visit! 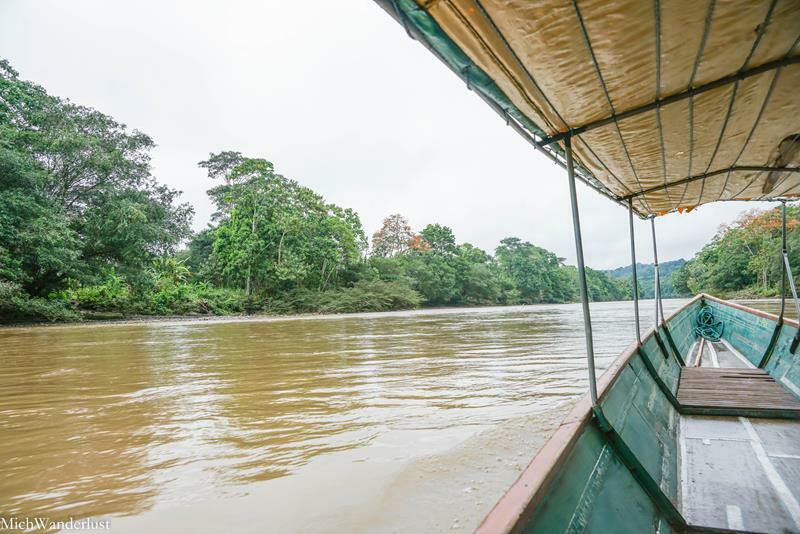 You have to visit the Amazon with a “tour” though – in the sense that you have to stay in a lodge and can’t wander too far off by yourself. At least that’s how it is in Ecuador – not sure about other countries. Thanks for stopping by, Sally! What a fantastic adventure! The photos of the rescued wildlife are especially wonderful. What a beautiful ocelot. Finding you from Weekly Postcard and I must say the design of your blog is so appealing! Thanks so much Sharon, the compliment means a lot to me 🙂 I always enjoy your posts on the Weekly Postcard! This is awesome! Love that jungle lounge and hammock! That GIF made me giggle! Thanks for linking up with #TheWeeklyPostcard! 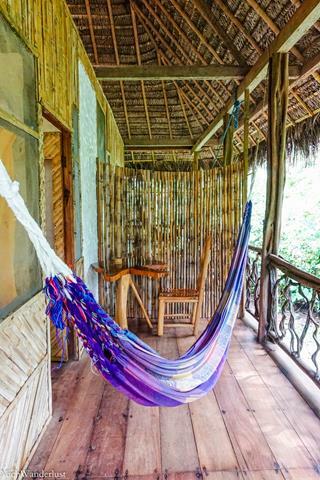 Love ecotourism and this looks incredible. My kind of place. I would like to volunteer there sometime. Keeping this place in mind for the future!! Hope you get to volunteer there someday. Would love to hear all about your experience there! Thanks for stopping by, Cherene! Looks like an amazing place to stay and work on your Spanish! Laurence spent several weeks in Ecuador but I have never been and would love to experience the Amazon. Ecuador is an amazing country. It’s relatively small but has 4 very different regions (the Andes, the Amazon, the coast and the Galapagos) so you can see a lot in a short time! Hope you get to visit it someday 🙂 Thanks for stopping by, Jessica! I totally agree – volunteering was the best part of my trip, hands down. 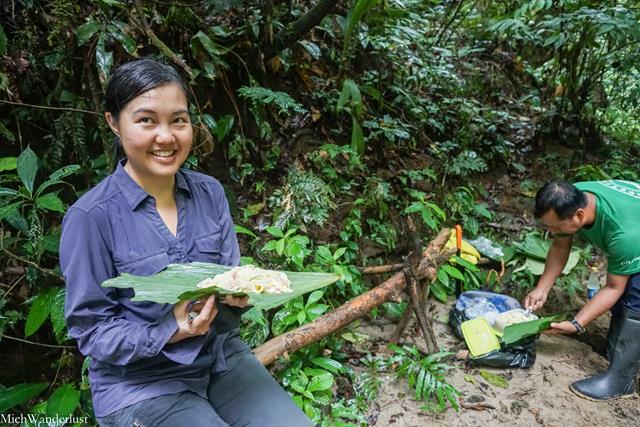 Hope you get to experience the Amazon some day, Anda – I think you’ll really enjoy it! It’s such a unique place, and I say that someone from the tropics. 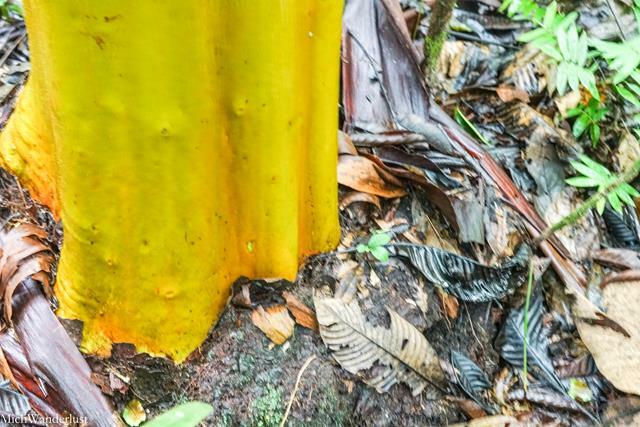 🙂 in Ecuador, Yasuni is the most famous and has the greatest biodiversity, but it’s also quite expensive so I didn’t go there. 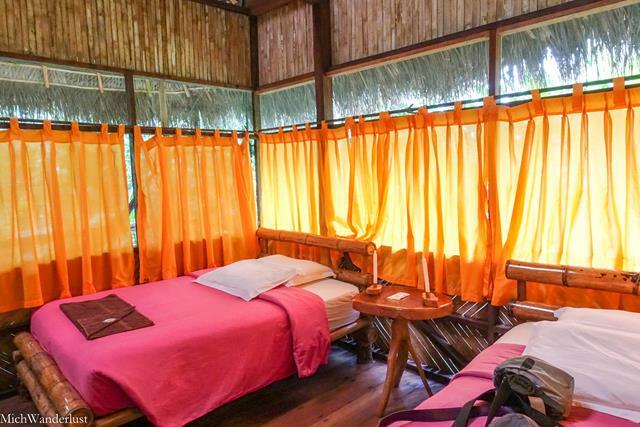 I can recommend Nicky Lodge in Cuyabeno Nature Reserve and this Liana Lodge near Tena, though! 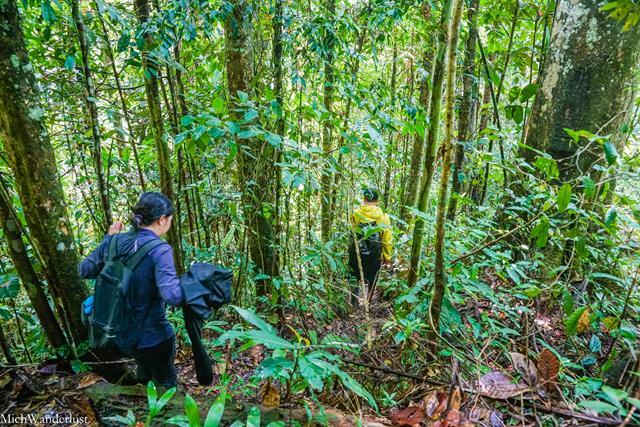 I’ve never been to the Amazon.’Looks like an interesting adventure.